The model shown above indicates the relative sizes of the structures within a chloroplast and how individual chloroplasts can include up to about 50 thylakoids. However, it would probably take too long to draw such a detailed representation in study notes or a test or exam. It is much easier to learn a simple diagram of a chloroplast (below). What is a chloroplast ? A chloroplast is a type of organelle. Chloroplasts are the site of photosynthesis in eukaryotic cells. They are only present in photosynthetic cells e.g. plant cells and algae. There are no chloroplasts in animal cells or bacteria cells (bacteria cells are also known as prokaryotic cells and do not contain any membrane-bound organelles). As shown in the diagram of a plant cell, chloroplasts are bigger and fatter than mitochondria. That is why chloroplasts settle first when photosynthetic cells are homogenized and centrifuged. A typical chloroplast has a biconvex shape and a maximum dimension of about 5μm (i.e. 5 micrometers = 0.005 mm, see scientific numbers for more about the units). Each chloroplast is surrounded by a double-layered membrane i.e. it is enclosed by two membranes separated by an intermembrane space. In green plants both the inner membrane and the outer membrane surrounding chloroplasts are lipid-bilayer membranes. Note: The figure above is a simplified diagram of the structure of a chloroplast. The structures are not necessarily drawn to scale e.g. 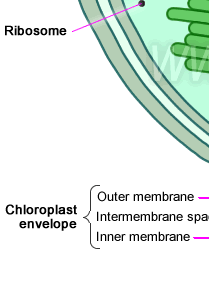 the membranes enclosing the chloroplast are shown larger than in real life in order to show the intermembrane space. Parts of a chloroplast are shown in enough detail to help students re-draw this diagram by hand to include in study notes or homework. The following table includes comments about each of the structure found inside chloroplasts. Overall the chloroplast envelope is semi-permeable. It is permeable to glucose molecules and certain ions including Fe2+ and Mg2+, and oxygen and carbon dioxide. The chloroplast matrix is called the stroma and contains enzymes that catalyze the light-independent reactions of photosynthesis. 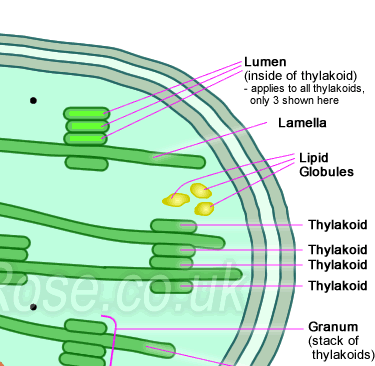 The light absorbing molecules within thylakoid membranes are arranged in photosystems. Thylakoids are also the sites at which ATP synthesis occurs within chloroplasts. Thylakoids are arranged in stacks called grana (plural). A single granum is a stack of several thylakoids one on top of another. 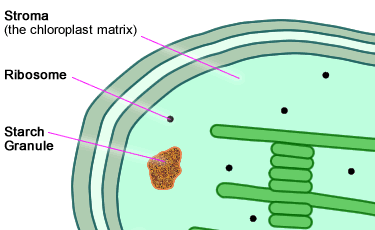 As shown in the diagram and model above, there are many such grana within each chloroplast. As shown above, stromal lamellae connect two or more grana to each other. In this way the lamellae act as a "skeleton" of the chloroplast, maintaining efficient distances between the grana, thereby maximizing the overall efficiency of the chloroplast. Each chloroplast contains one or more molecules of small circular DNA. Starch exists in chloroplasts in the form of tiny lumps called "granules" or sometimes "grains". These are present because they are the (insoluble) storage carbohydrate product of photosynthesis. Lipid globules are also present in chloroplasts. Chloroplasts contain the smaller type of ribosomes (i.e. "70S ribosomes"), which is the same type as those freely distributed around the cytoplasm of prokaryotic cells. Note: The numbers listed above-left are only for ease of reference to and discussion of this table. As indicated in the model of a chloroplast at the top-right of this page, a typical chloroplast contains many of these structures. Remember : A chloroplast is an organelle (found in plant cells but not animal cells); a chloroplast is not a cell. For more about cells: the structure of a plant cell, the structure of an animal cell & comparison of plant, animal and bacterial cells. See also very simple information about chloroplasts and photosynthesis (via 3 short YouTube videos).